Ultimate Fighting Championship (UFC) was back at it again, as the world’s largest mixed martial arts (MMA) organization staged its final event of 2016 with UFC 207, which went down last night (Fri., Dec. 30, 2016) inside T-Mobile Arena in Las Vegas, Nevada. Headlining the bout was a women’s Bantamweight title fight that saw Amanda Nunes absolutely obliterate former division champion — and one of the biggest stars in the sport — Ronda Rousey … in just 48 seconds (see it again here). In the pay-per-view (PPV) co-main event of the evening, Cody Garbrandt lived up to all the hype and backed up all of his talk, defeating Dominick Cruz via unanimous decision in a masterful performance to claim the 135-pound title (video highlights). It was a toss up between Nunes and Garbrandt as to who’d get the top spot, but Nunes walking through Rousey like a hot knife through butter, picking apart “Rowdy” from the opening bell en route to a very impressive 48-second technical knockout victory was just too impressive to be a runner up. The win is undoubtedly the biggest of her career, even more-so than winning the title from Meisha Tate at UC 200 earlier this year. Why? It’s simple: Rousey is without a doubt one of top two (Conor McGregor being the other) stars in the game today. She had the women’s division on lock for years. 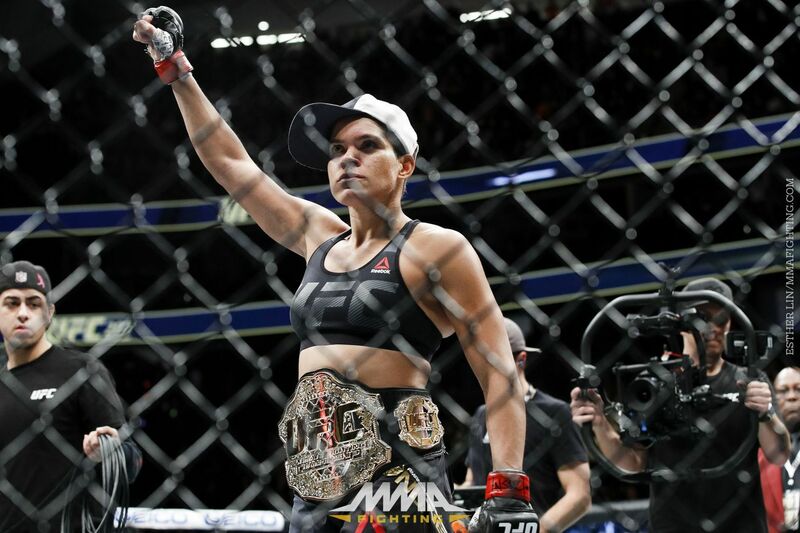 And while she had some of her mystique already taken from her by Holly Holm, Nunes proved that she is indeed the champion by finishing the job. In doing so, Nunes gave UFC’s public relations department a big “f**k you” for leaving her out in the cold, staring through the window while Rousey got all of promotional shine, even though she made it clear she didn’t want it. And while Rousey may have deserved it, Nunes was (and remains) the champ. Indeed, after obliterating the queen of MMA, she earned the respect she failed to get in the lead up to the fight, proving once and for all that the stage is all hers. Garbrandt walked the walk after talking the talk (repeatedly) by absolutely schooling long-time champion Dominick Cruz for five rounds, making it look easy against a man who hasn’t tasted defeat in a decade. “No Love” proved that he is more than a heavy-handed brawler by showing his patience, not losing his cool trying to find his range on the ever-elusive Cruz who has made a career of making people miss. And while Garbrandt did miss on occasions, when he connected, he made it count, flooring “The Dominator” repeatedly throughout the fight. To add insult to injury, Garbrandt repeatedly channeled his inner-Nick Diaz and Anderson Silva by mocking the dominant champion, showing off his best dance moves and even doing some push ups in the middle of the fight. While I personally could have done without those extra shenanigans, in doing that, Garbrandt sent a message that no one should ever underestimate him after a brilliant performance against a man who simply looked unbeatable for his entire career. Not only did Garbrandt win himself a new shiny title, but he could very well be on his way to become the promotion’s next marketable star. Dillashaw fought his fight and did what he had to do to get the “W” over a hard-nosed veteran in John Lineker (highlights). Using his ever-improving footwork, “Viper” set the pace of the fight with his movement and takedown’s, ground-and-pound and made sure to not let John land his “Hands of Stone” that have put countless of foes out for the count. In getting the victory, Dillashaw assured himself a shot at the new 135-pound champion, Garbrandt, who just so happens to be his former Team Alpha Male (TAM) stablemate who wasn’t too thrilled when Dillashaw left the squad to train elsewhere. While “No Love” is adamant he is going to give Cruz a rematch, company president Dana White vetoed that notion by saying Dillashaw was in fact next in line during the post-fight show. All of the Monday morning black belt’s are going to have their theories as to where it all went wrong for Rousey. From being gone from the sport too long to not being mentally stable for a return, there will be a bevy of breakdowns trying to explain how Rousey suffered such a quick loss to “Lioness.” One thing we can’t blame it on is distractions, as Rousey went on a full media blackout to solely focus on the task at hand, a first for the promotion. It didn’t matter, as Rousey never got going. Like, at all. And that’s a testament to Nunes, as she used her distance and long reach to pick apart Rousey on the feet and eventually forcing Herb Dean to put an end to the punishment. Nunes was simply better. As for what’s next for Ronda, that remains to be seen. And while I hate to assume what a fighter is going to do, I don’t think it’s a reach to say that “Rowdy” will probably hang them up for good. She didn’t take her loss to Holm too well, so you know this one is going to sting. How bad, or how well, she takes it is anyone’s guess. If she does walk away, she should pick her head up knowing she did her part to bring women’s MMA to where it is today. She’s a champion, a millionaire and there isn’t much else she can accomplish in the sport that she hasn’t already. She’s a true trailblazer for women’s MMA and got over the hump that Gina Carano never could get over. And no amount of losses can ever take that way from her. For complete UFC 207 results and coverage click here.